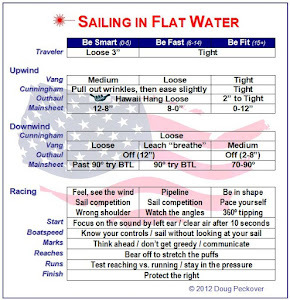 In light conditions, I use a really thin main sheet that makes it much easier to play the main when sailing on a run. Plus, the main sheet weighs less and is less likely to drop and drag in the water. But, a thin main sheet easily gets tangled into knots. If you round the weather mark and cannot let out the main, you'll get passed by many of the boats that you worked so hard to pass. When approaching the windward mark, I cleat the main and then run the rest through my two hands (one free, one steering) to make sure there are no knots. If there is, then I've got a chance to untangle the mess before rounding. The second reason is from something that I found by accident in race 3 at the 2009 Master Worlds. This is how I described it in my journal that evening: Started mid-line with a good lane. Punched out with excellent starboard tack speed - one of my weaknesses I've been working on. Doing something I've never done before - cleating the main and focusing on steering. It was light and coming off the starting line on starboard tack, I cleated the main, grabbed the grab rail with my right hand, and locked my arm to make my entire body rigid to then press down while steering the boat. I'd never tried this before and for those conditions, it worked really well. I never use cleats when hiking because, for me, having something to hang on to seems to make hiking a little more comfortable. 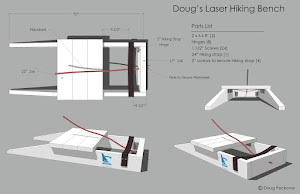 For the same reason, I do not have a main sheet on my hiking bench because I want it to be uncomfortable to make the training a little more intense. 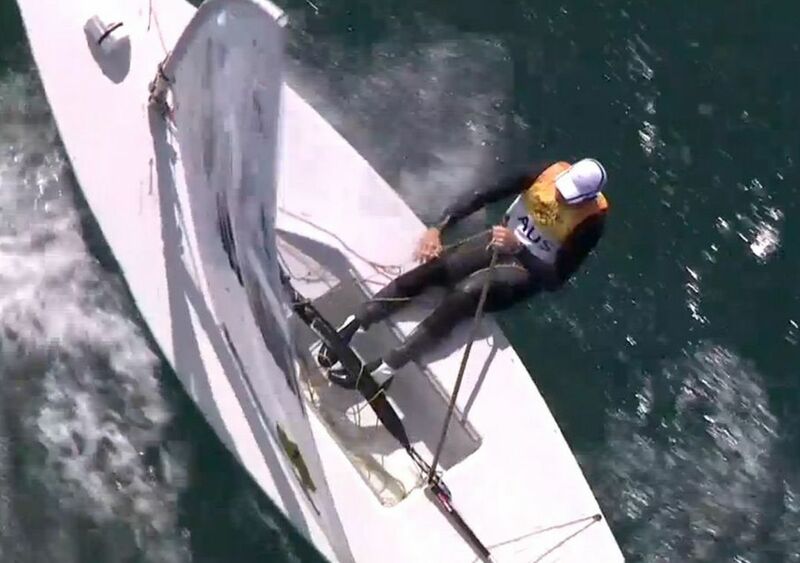 Looking at the videos from the London Olympics, some sailors had cleats and some did not. Tom Slingsby plays the main constantly and appears to not have them. My recollection is that all the charter boats at the Worlds come with cleats. I noticed from the videos and pictures at the Olympics that some had them and some did not. For light sailors, like Pam, cleats are almost essential. She uses the cleats while hiking and when the wind is up, she pulls the main sheet in through the cleat. This not only give her hands a break but it becomes like a third hand for her. Also, because she is light, she will almost never be so far forward that she bumps into them. So for a light sailor, there is no down side to having them if they always keep a hand on the main to be able to release it quickly. If you're installing them, use this diagram from the Laser Class Handbook to locate the wooden backing plate so that your cleats are properly secured. 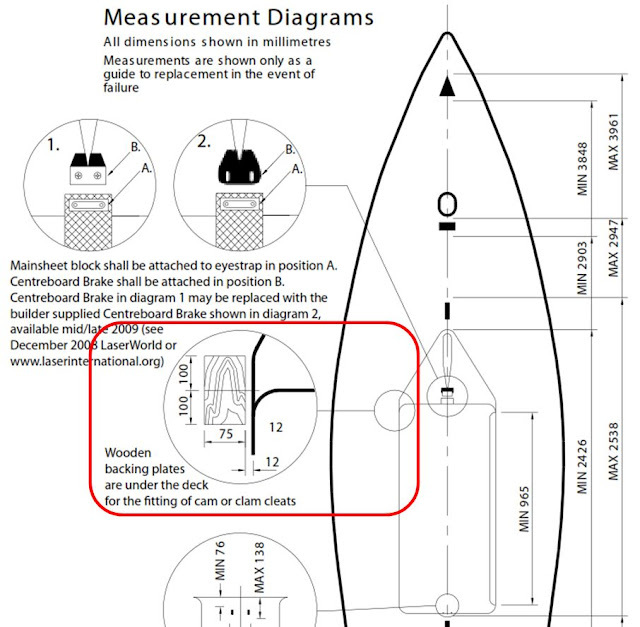 I have mainsheet cleats on my current Laser but hardly ever use them and, before reading this post, would definitely not have installed them on my next Laser. But that first tip alone has changed my mind. I can't count the number of places I have lost in races because of that damned tangled mainsheet at the windward mark. Will try that second tip too. For some reason, it's always easier getting rid of a knot going upwind than when going down. I guess its because it's not costing me places and I'm under less pressure to sort things out. A way to reduce the chances of a problem is to tie the end of the main to the back of the hiking strap. A thin main sheet will still get tangled occasionally, but at least you know that it's a bunch of loops and not a real knot. 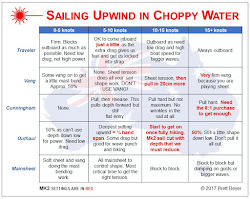 I do tie the end of my mainsheet off but I still get knots. i know that logically they are only bunches of loops but they can still be hard to unravel. I'm sure you are right that the secret is to check the whole sheet while still going upwind. Another little secret is to not wear boots as loops love boots. And you can never feel them. When I sail internationally, I'm sometimes known as "the barefoot sailor" guy. Of course, boots are needed when it's cold. But for me, any type of clothing cuts off the senses and is only worn if really needed. Hi Billy, thanks for your kind comments and congratulations on winning your first Worlds! It's amazing how close the competition can be - I won a Worlds by 2 points once and lost another by 1 point, so every point definitely counts. You'll also find that having won your first, the next ones will be a lot more relaxing. I'm glad you're trying night sailing with your Dad as it's best to do this with another person for safety reasons (don't forget a whistle and running lights/a flashlight). You'll get a feeling for things that just cannot be found during the day. I try to pass these along in this blog but you'll find out that it's really difficult describing some of the things that you learn. Be safe and keep in touch!! Very impressive and cool. And realistic. It's great to see so much support from your Dad. But be careful about leaning too far back. And you'll add years to your sailing career by doing hip flexor stretches before and after hiking. Watching the races from Perth 2011 again, I've noticed that Tom has cleats and uses them always. Yes, I saw that he sometimes cleats his main half way though a tack as a part of switching hands. Had not seen that before.